Before we visit and do our cooker cleaning service magic, customers often ask how we can clean an oven and cooker better than they can. The answer is that we are specially trained in oven and cooker cleaning, use cleaning products not available to the public. The hot fluid dip-tanks in the specially adapted van that parks outside your door, soaks off hardened grease and baked-on food spills at lightning speed – in under an hour. 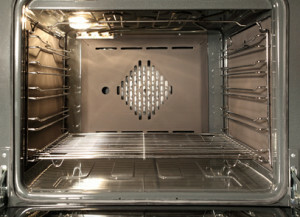 Our entire oven cleaning process produces no noxious fumes, gases or lingering odours. 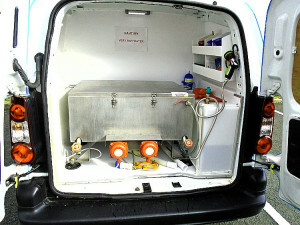 Our vans are unique and designed especially for us, with insulated thermal tanks. These keep the cleaning fluid warm during the day for effective cleaning of the cooker parts. We bring everything required with us. They check for scratches or damage and give you the opportunity to ask any questions. Our technician may take photos of your cooker, to make sure they put the knobs, screws or hinges back in the correct places. Oven doors are removed to make sure that each area is accessible. Glass doors, racks and shelves are removed to the van. Ask your technician if you have any trays you’d like cleaned at the same time. In the van, the items are placed in the dip tank and left to soak while the oven cleaning takes place. Because the soaking tanks in the van are needed during the cooker cleaning process, there must be vehicle parking outside or very close to a customer’s home. Protective sheets are laid on the floor to collect any grease, crumbs or carbon scrapings. After the cooker cleaning, we just roll up the sheet and take any debris with them when they leave. Your appliance will receive a deep clean using only the highest quality products. Depending on the level of service required, filters and bulbs are changed at this point. Finally the items in the tank are rinsed, dried and brought back inside. The appliance is reassembled and tested to ensure everything is working to your satisfaction. Check out our Oven Cleaning Prices with Extras that cover a whole cooker. Ready To Use Right Away!